As you know I often have to travel for work, which is not the easiest thing for this momma; however, it just takes one look at these smiley faces to know it will all be OK... even if it a gloomy kind of day that later requires to me to get on a plane and leave my family for 2 days for work. You simply add the roast to the crock pot. Pour the dry onion soup mix over the roast. Turn the crock pot on low and let it cook for 8 hours or whenever you get home from work. Needless to say, my roasts have been in the crock pot for over 10 hours in the past. You can serve this roast many different ways, but we simply love to shred the beef and serve it on buns as a yummy sandwich. As I have said with a few other recipes, it doesn't get much easier than that. Yesterday, we got the exciting news that Uncle K, The Farmer's youngest brother, proposed to his amazing girlfriend and the 3 kids at this pig pen will soon have a new Aunt, Aunt N. They couldn't be more excited as they love her to pieces as we all do. They even asked me yesterday if they have to wait until the wedding to start calling her Aunt N.
I think for all involved in might have been a case of love at first sight. 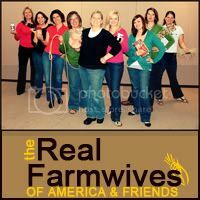 Welcome to a special quarterly Farmer Fridays featuring The Real Farmwives of America & Friends. Today all of the Farmwives & Friends are blogging about the cycle/circle of life on their family farms. Just like many of the stories being told by my fellow Farmwives & Friends, the circle of life on the family farm is full of laughs and tears. It is very rewarding. If it wasn't, we wouldn't do it; however, it can be very demanding and not always go as planned especially on a livestock farm. The fact of the matter is we are dealing with living creatures and we are not in control. Every day on our family farm, our children are around new life as we have baby pigs being born almost every day which is an amazing thing to share with them. They then are able to watch these pigs grow and eventually become the pork on our family dinner table. This is a lesson The Farmer and I both learned at a very early age and I'm glad we did and are able to pass this on to our children. The purpose of livestock is to produce meat. On our family farm, our number one goal is raise healthy pigs that become affordable and nutritious pork for our family and yours. That is their cycle of life. I will admit at times, especially during my 4-H career, this has caused many tears, but it is all part of life and living on a family farm and I wouldn' trade it for anything. So Ott, A has me cooking out of my comfort zone again ... canned tomatoes. The truth is I have never cooked with canned tomatoes. In fact, I didn't even like tomatoes until about 8 years ago. I grew up a ketchup and tomato soup fan, but beyond that tomatoes and I were not friends. Any way since canned tomatoes are the secret ingredient for Ott, A's March Iron Chef Challenge, I decided now was the time I needed to conquer canned tomatoes. So thanks to the super cool package of tomato goodies I received from Red Gold (Thank You Red Gold), I had a brand new cookbook of canned tomato recipes to choose from or should I say for The Farmer to choose from for this challenge. That's right, I let The Farmer choose the recipe I would use for this challenge. Needless to say, he found a recipe that included pork and was a winner for this pig pen. Cook the pasta using package direction; drain. Cover to keep warm. Heat a nonstick skillet over medium-high heat. Add the ground pork and onion. Cook until the ground pork is brown and crumbly, stirring frequently; drain. Bring to a boil; reduce heat to low. Simmer for 5 minutes, stirring occasionally. Add the pasta and zucchini and mix well. Cook for 2 to 5 minutes or until heated through, stirring occasionally. And thankfully that goodie package from Red Gold kept Little Sissy busy while I cooked. Well I think my internal clock is finally back to normal after an extended weekend get-a-way to California wine country last weekend with The Farmer and some amazing friends. The 3 hour time differential plus the whole daylight savings time change was not kind to my internal clock, but it was definitely worth it. I say my clock is back to normal because after a full day of work yesterday, a visit to our accountant, and kindergarten round-up for Bubby (where is the time going?) I feel asleep as soon as my Boilers were assured of a trip to the round of 32 and needless to say never got my Farmer Friday post done. So welcome to one of those rare Saturday editions of Farmer Fridays. It's that time of year around the farm where everyone is excitedly anxious. Mother Nature has been teasing us with some beautiful weather to let us know that planting season is just around the corner and that has everyone at this family farm beyond ecstatic. So since it is still a little too early to get in the fields, now is the time to do all those outside projects we couldn't get done during the winter because once planting season starts we won't have time to do any other projects until planting season is all over. 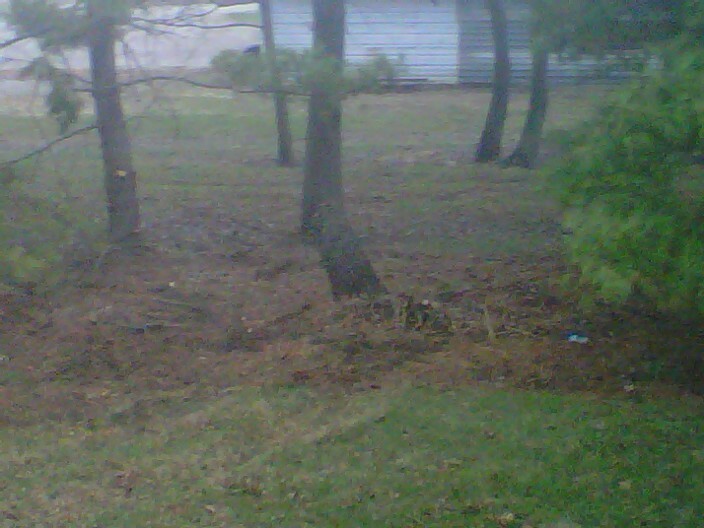 The big project yesterday was cutting down some trees close to my mother-in-law's house. Now these trees serve as a wonderful wind break and privacy fence; however, a couple of them have died over the years and needed to come down. One in particular, Bubby liked to call "The Widowmaker." If you watch enough logging shows as Bubby and The Farmer do you know exactly what I'm talking about. If you aren't as lucky as those of us at this pig pen, it is basically a tall, tall tree that could be very dangerous to cut down in essence making the spouse of the logger a widow, if you get my drift. Bubby loves logging shows so much that he told me the other day that Gamma, my mother-in-law, was going to have to call Jay Browining to have him cut down The Widowmaker. Never mind that he is located in the Pacific Northwest. Since he doesn't make house calls, Bubby and Pop Pop decided to take matters into their own hands yesterday. Now I only got one picture of this entire escapade and that was of the remaining stump at the very end, but let's just say it involved a chain saw, the bobcat, and two very smily boys (Bubby and PopPop). Needless to say, The Widowmaker is gone from this family farm. So although we aren't going into the logging business anytime soon, it was a pretty exciting day for some on this family farm. Now if I could only get my deck built before The Farmer went to the fields this spring, all would be happy. This is a recipe I got from a co-worker almost 11 years ago and it has become one of the easiest and liked by all go-to recipes I have. It involves 5 ingredients, one pot, about 15 minutes of prep time, and approximately 25 minutes to cook. I don't know about you, but at this pig pen, it doesn't get much easier than that except for maybe those duck legs I made. First I add the green beans including the liquid to the pot. Then I cut up the smoked sausage into to 1-2 inch sections and add smoked sausage to the pot. Then I use the empty green bean can to add more water to cover the ingredients in the pot and add 4 beef bouillon cubes. Bring the covered pot to a boil over medium to high heat. Once a boil is achieved, I turn down the temperature and let the ingredients continue to cook covered for approximately the next 25 minutes stirring occasionally. Basically you want to cook until the potatoes are tender. Then it is time to enjoy a meal that contains a meat, potato, and vegetable. Serve with a fruit or ketchup and you have a complete meal in less than an hour. 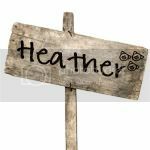 Today is another special edition Farmer Fridays as it features a guest post from one of The Real Farmwives of America and Friends. Ahhh… the month of March. Some may think of this month and have images of St. Patrick’s Day come to mind, while others may think of snow and cold or the start of spring, but this Real Farmwife of America thinks of March as the month for lambing season. I’m Ott, A from the blog a Latte with Ott, A and my family has raised purebred Shopshire sheep on the same farm since 1919. All of our breeding stock are registered and we work hard to ensure true breeding characteristics in our bloodlines. Our sheep are raised to be sold as 4-H lambs or freezer lambs. And let me tell you no matter how cold and dark it is on these early March mornings nothing beats going out to the barn and finding freshly dropped lambs. We keep our brood ewes (female sheep) outside the barn in smaller pastures with sheds so they can get out of the wind and rain. They have plenty of grain and water and can continue getting exercise while outside like this up until they have their lambs. Once they deliver their lambs they are moved inside the barn into a pen called a bonding pen. These are nice sized pens where the ewe and lambs are together by themselves with access to hay, feed and water. This time alone together allows the ewes and lambs to get to know each others scents and sounds so they know their mom from any of the others and visa versa. It also gives the farmer the ability to keep a close watch on the lambs and make sure they have figured out how to nurse (get milk) and that the lambs have gotten up and walked around. The ewe and lambs will be kept in this pen for 3-5 days depending on how well the lambs are doing. Ewes that have multiple births (twins or triplets) will say an additional day for each extra lamb they have. Twins are very common in our breed of sheep and we usually get one or two sets of triplets each year. On the 2nd day in the bonding pen we give the lamb a couple of shots. These shots are for the lambs own health and well being. The first is a shot of vitamins; mainly Vitamin E and Selenium as these are deficient in our area. The other is a shot of tetanus, just like you and I would get at the doctors office, and this just helps ensure the lamb does not get lock-jaw. Next the lamb will get an ear tag. You and I may have names, but our sheep have numbers and this helps identify them. We also use this number for our record keeping purposes. The tag goes in their ear which is cartilage and only hurts for a second, just like it only hurt momentarily when you got your ears pierced. On the 3rd day, the lamb will get another shot; penicillin. At this time we will also put a rubber band on their tails. The tails are all cartilage and in female sheep the tail tends to get in the way when they go to the bathroom, and this can cause maggots and infection if left untreated. Also, in males the tails become a place where fat is stored and that is not desirable for getting the lambs up to market weight. The rubber band stops blood circulation to the tail and in a few days the tail will fall off on its own. Again the lamb only feels the pain for a few minutes and then is up running around again. By the 4th day, if both the ewe and lambs are doing well they are ready to be moved into a creep. To learn more about the creep stage check out a Latte with Ott, A’s blog next Friday and she will explain that all in detail to you. About 2 weeks ago, Bubby finally had his first loose tooth, one of his bottom front teeth. He was so excited that it was loose; however, he was petrified for it to actually come out of his mouth. He would gently wiggle it, but wouldn't dare try to pull it out. It essentially was barely there, but he wouldn't let me help. Then came lunch and half way through lunch Big Sissy said, "Bubby, where is your tooth?" Sure enough, his tooth had come out on its own; however, it was nowhere to be found. Needless to say, I think Bubby swallowed his tooth. I think I would have been scared to death, but he took it all in stride and was soon all smiles, but he was worried on if the Tooth Fairy would still leave him any money. Being the good big sister she can be, Big Sissy offered to help Bubby write a letter to the tooth fairy explaining what had happened; however, she didn't want Bubby to be the only one that got a present from the Tooth Fairy that night. After dinner, Big Sissy decided she had a loose tooth as well and unlike her brother, she was determined it would come out that night. So after wiggling and pulling, she finally lost her tooth and the Tooth Fairy was headed for this pig pen to collect not one, but 2 teeth. There's never a dull moment at this pig pen and that being said, be sure to check out my guest post at GOODEness Gracious and "like" 3 kids and lots of pigs on Facebook. It's been a busy week at this pig pen as always. Farmer Fridays - Where can you buy our pork?